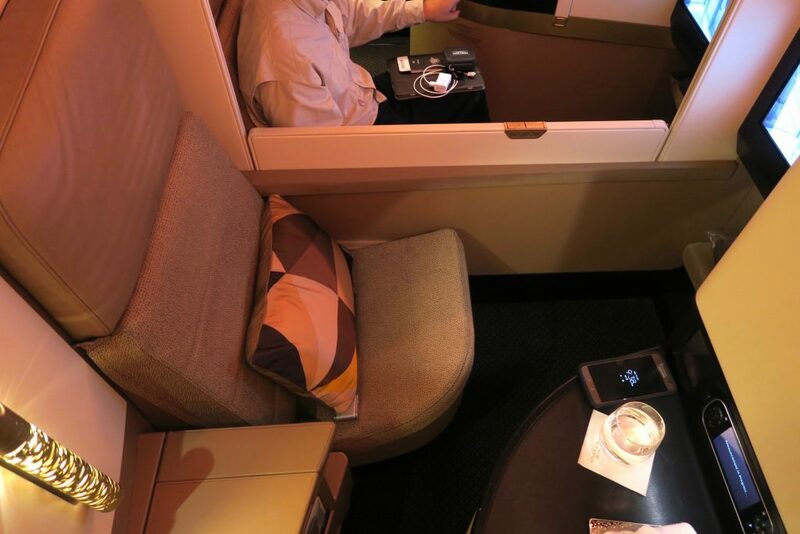 Etihad Airways Business Class A380 Sydney to Abu Dhabi - The New Business Studio - Holy Smithereens! One of the luxury travel trends predicted last year was the change in the travel demands of luxury travellers. They now want something beyond Business and First Class in their travels. They want something simply never imagined and experienced before. In 2014, Etihad came out with #Reimagined cabins which brought commercial flight to a new level of luxury. One of these cabins is the Business Studio, available on both the Airbus A380 and the Boeing 787-9 aircraft. 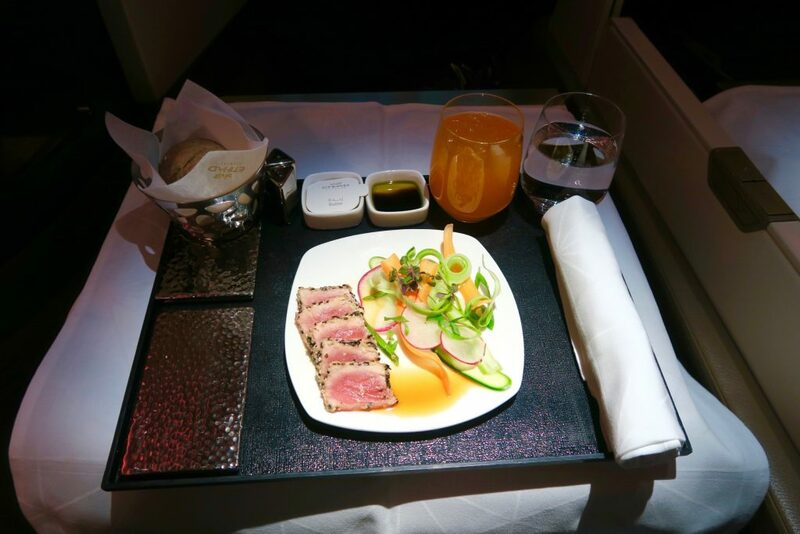 And this is how Etihad’s new products brought luxury travel to a whole new level. They are not just improved versions of existing products, but something completely new and exciting. 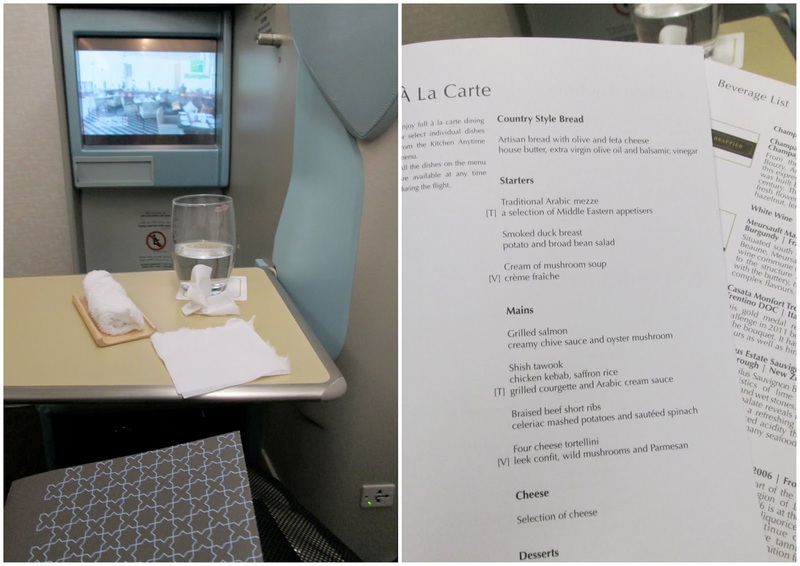 Last month, I was able to try the new Business Studio (Business Class) product that Etihad Airways has on their A380. 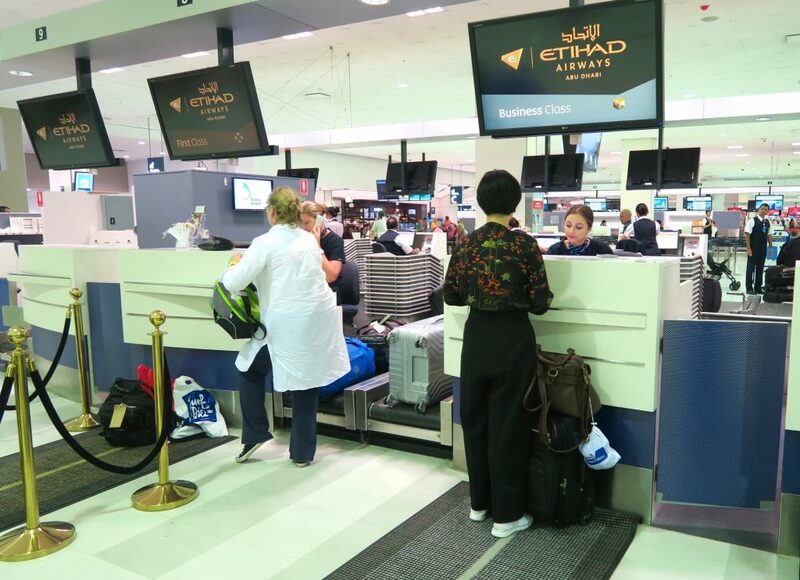 There are two rows of check-in counters for Etihad Airways at the Sydney Kingsford Smith International Airport. One row for Economy Class, and one row for First and Business Class just across. Check-In was quick and efficient, and we were also given fast track passes for Immigration. 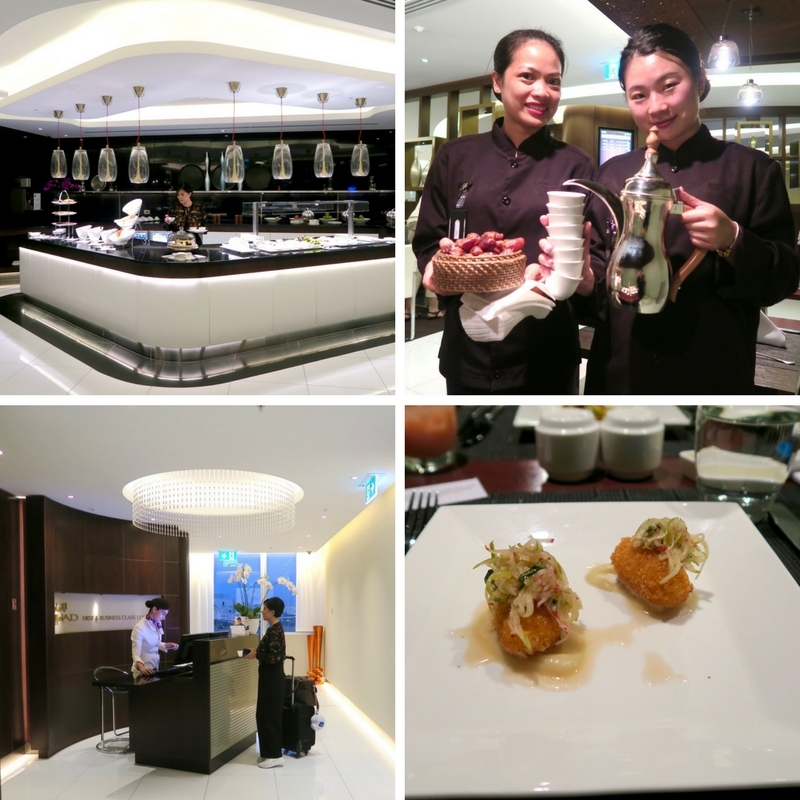 The Etihad Airways First & Business Class Lounge is found towards the area of gates 50-63. The lounge itself is located in the lower level. Touches of Middle Eastern hospitality is evident throughout the lounge as we were welcomed with dates and Arabic coffee. Read my separate review of this lounge. There is a self-serve buffet along with a la carte menu available. The a la carte menu offers moderate-sized dishes which is a perfect opportunity to sample all courses without having to rush through them. The lounge is also designed consistent to Etihad Airways’ cabin design and theme- modern and sleek with off-white and dark oak as its main colours. There are 70 Business Studio seats on the Airbus A380. The studio seats include a 22-inch wide reclining chair which converts into a fully flat bed. The leather seat covers are tailored by Italian furniture maker Poltrona Frau. It’s buttery smooth and still carried with it faint traces of a new car smell. As soon as we settled in our seats, we were offered drinks and hot towels. With our flight departing at 21:50 (9:50 PM) , supper and bedtime were next in agenda (after takeoff). As such, the cabin crew assigned to my zone took my meal preference prior to takeoff. She also offered to put a mattress lining over my seat, which was handy for sleeping as it provides extra cushion when the seat lies flat. The mattress lining also prevented the leather seat from becoming too hot later on. The Business Studio cabin on the A380 has a forward/rear seating combination. All seats have direct aisle access at a 1-2-1 configuration. 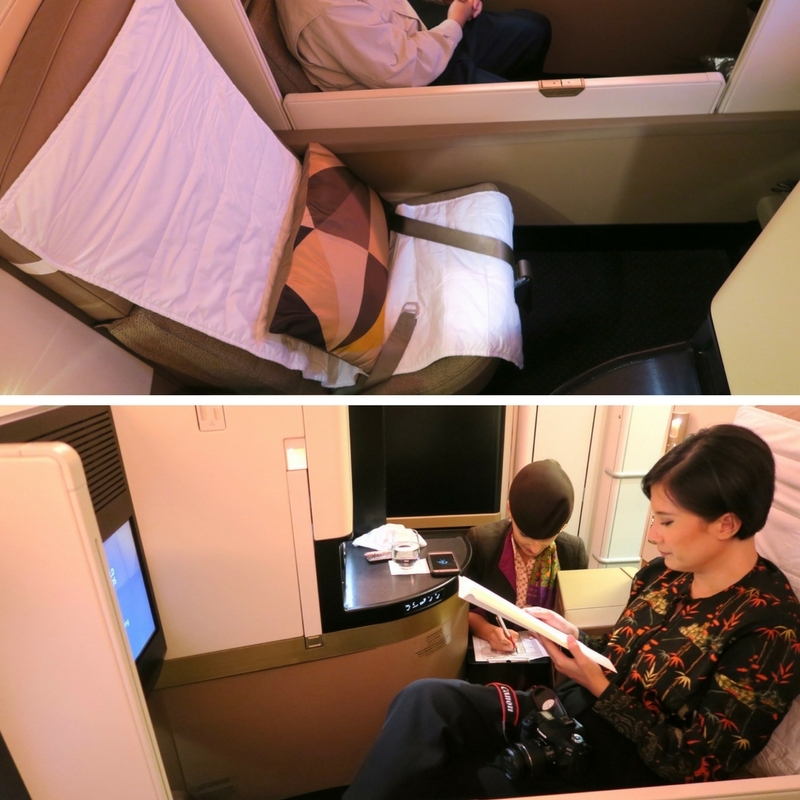 The Business Class cabin, along with First Class, and The Residence, are all located in the upper deck of the A380. Seated in row 26, we were in the last row with the galley behind us. The two main things that stand out in the Business Studio seat for me is abudance of storage space for personal items, and the focus on privacy. The privacy walls and partitions ensure that there is very minimal exposure for passengers especially when the seat is in a bed mode, a person walking along the aisle will not be able to see your face. 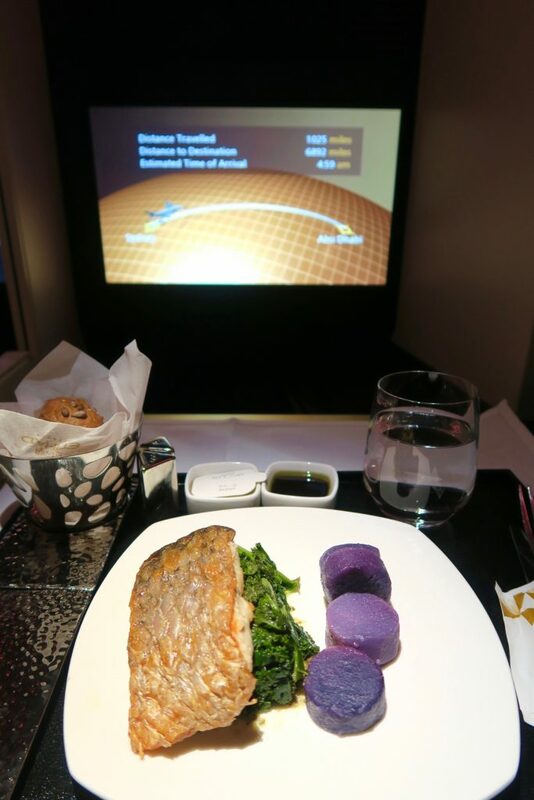 Two main meals were served on this flight. 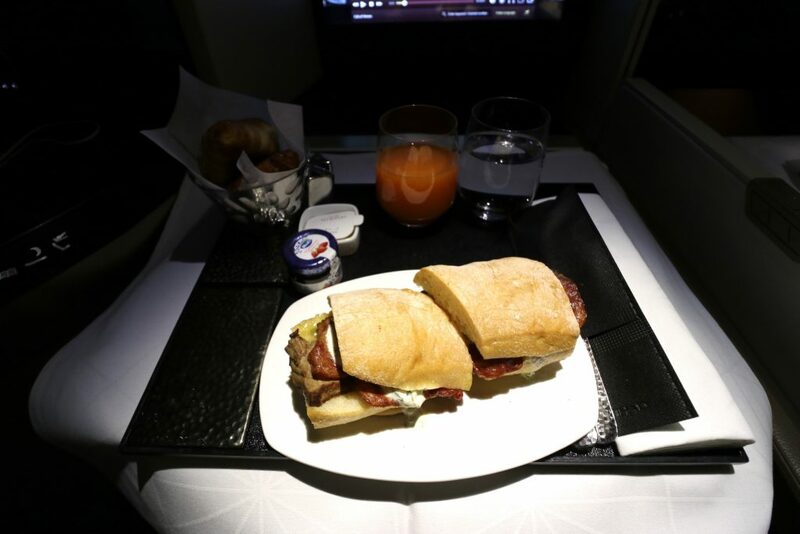 With a departure time of 21:50 and arrival time of 05:40 in the morning, supper and breakfast were the two main meals served during the flight. 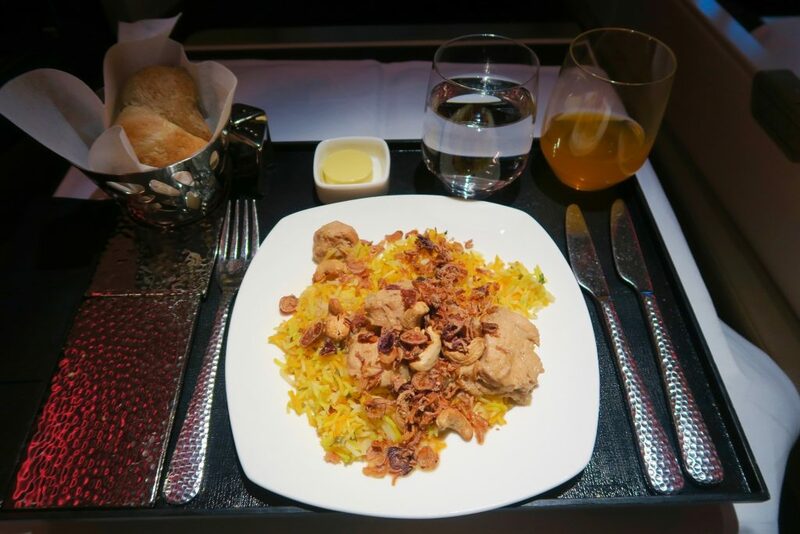 But there’s also the All-Day Menu which you can have at any point during the flight. The dining experience itself was such a treat made possible not just by the exemplary food but by the wonderful F&B Manager onboard, Peter Jackson. He gave wonderful suggestions and also introduced me to an interesting dessert combination (chocolate tart + passionfruit ice cream). 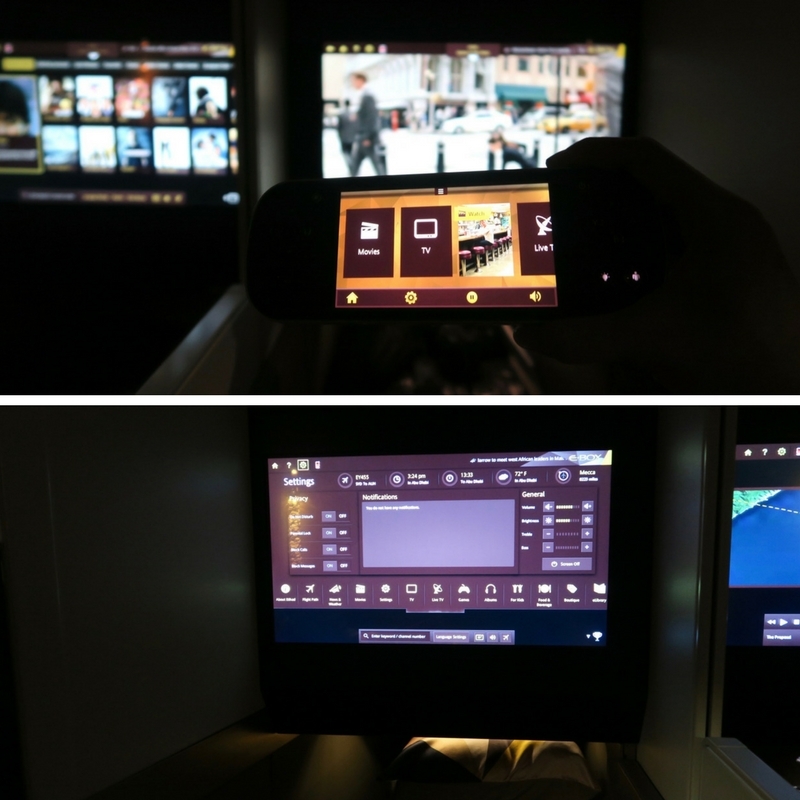 Etihad Airways’ entertainment system is called E-Box and along with audio and games, it has over 115 movies, and over 275 TV shows and channels. The touchscreen handheld remote (the size of a small smart phone) is quite convenient as it also had actual buttons on the side should you choose to navigate via the ‘classic’ way of button pressing / toggle. The Panasonic monitor itself measures 18 inches and is definitely just the right size for the Business Studio. 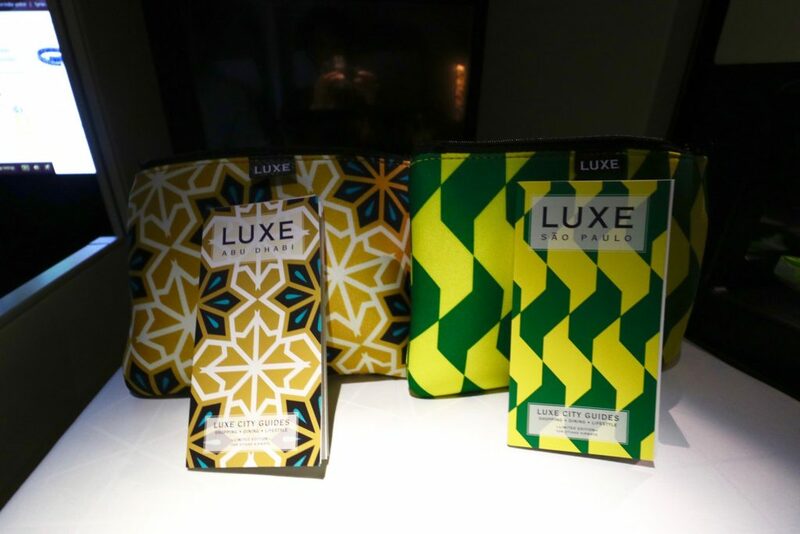 Etihad Airways’ Business Class Amenity Kits are such a treat. It is done in collaboration with LUXE City Guides , so there are different case designs for different key cities (that are Etihad Airways’ destinations). I got a very appropriate one (Abu Dhabi) and Zombie had Sao Paulo. Inside are actual LUXE guides in the city – what to do in the city in 24 / 48 hours, places to see, things to do – all in a comprehensive palm-sized card. The toiletries are made by UK brand Scaramouche & Fandango (yes, I was humming ‘Bohemian Rhapsody’ too). The decent-sized bag contains a Sleep Pack (Socks and Eyeshades), ear plugs, lip balm, facial hydrator and toothbrush with toothpaste. It was nice to see the facial hydrator, but I was quite surprised that no hand lotion was included. But I think this is to be given as Scaramouch & Fandango is a brand that focuses on male grooming. The scents are quite neutral though, and very mild. The highlight of the business class product on the A380 with Etihad Airways has to be The Lobby. Located on the Upper Deck of the A380 between First and Business Class, The Lobby seats up to six guests and is fitted with seatbelts, power supply and connectivity ports. This luxurious space serves as a bar, meeting place, and even a ‘home theatre’ for guests. As EY 455 departed late at night, The Lobby was pretty much empty after dinner was served. I imagine though, that it may get busy during daytime flights. Granted, Etihad isn’t the first airline to have a bar in Business / First class, but this The Lobby is probably the most impressive I’ve seen, where it feels like you are just in a hotel lounge. 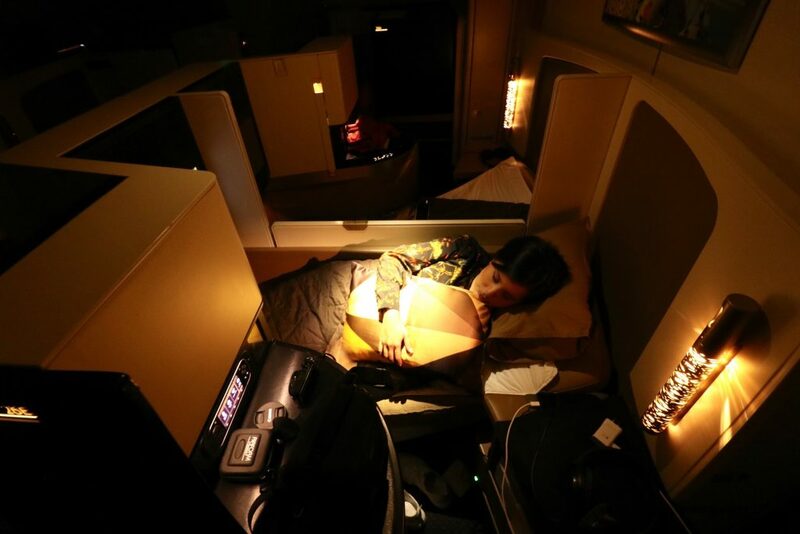 Etihad Airways didn’t design their aircraft with passengers in mind,but rather with a hotel guest in mind! At some point after dinner, our crew asked us if we would like them to make our bed. They provided a mattress cover, pillow, and will spread out the blanket for you. I slept really, really well on this flight. I had about a good 6-7 hours of sleep in the lie flat bed. It really helped that the environment of the Business Studio reflected that of a small hotel room. With the night light and lots of personal space for storage, it was easy to feel like you’re in an actual small bedroom. 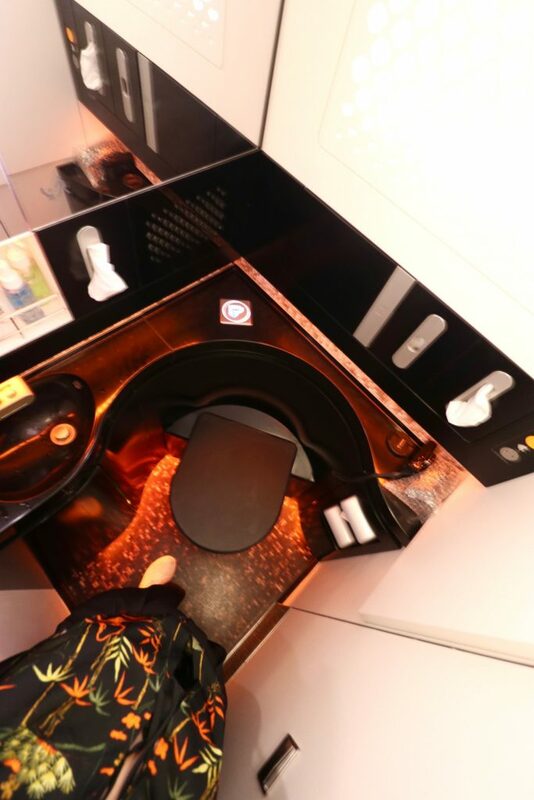 The photo is a poor attempt to capture the entire lavatory but I wanted to show how they made the floor and lighting consistent with the overall interior of the plane. I love small touches like thee. 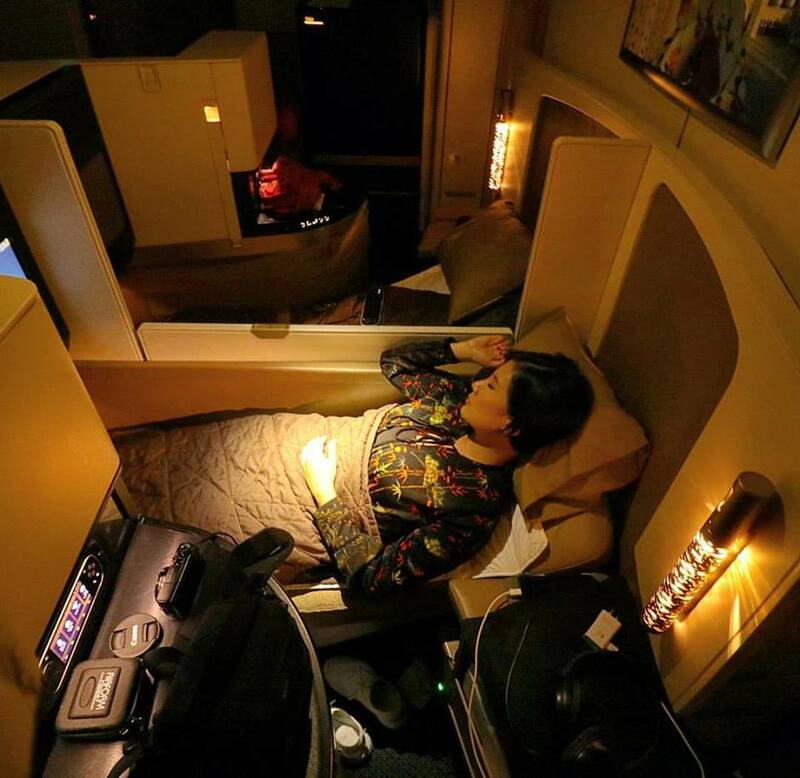 If there was anything else that could glimmer more than the astounding hard product of Etihad’s Business Studio, it would be the service provided by Cabin Manager Paula Dragomir and her team. It was so refreshing to see Paula talk and represent Etihad with pride and ownership you’d think she personally owned the company. She regaled us with the history and conceptualisation of the The Lobby (it involved lots of research and listening to customers) and how they are also focusing on a more personalised approach to customer service. Paula’s enthusiasm must have refelcted on her staff as we also received outstanding service from F&B Manager Peter Jackson, who gamely introduced me to an unusual desert pairing. When I opted for chocolate tart and vanilla ice cream, he pondered and then suggested that I go for passionfruit ice cream instead. 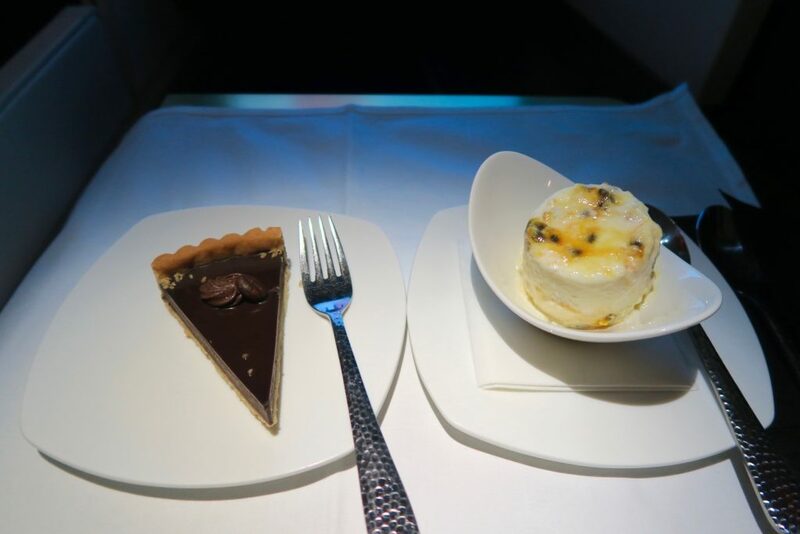 It was a wonderful suggestion – the tartness of the passionfruit ice cream balanced the sweetness of the chocolate tart. The presence of an F&B Manager onboard really made a difference as you feel like someone really cares about your dining experience onboard. Cabin Crew Tracy McDowall, who was assigned to our zone, was also extremely attentive to our needs, and despite the flight being more than 13 hours, her level of enthusiasm never waned. 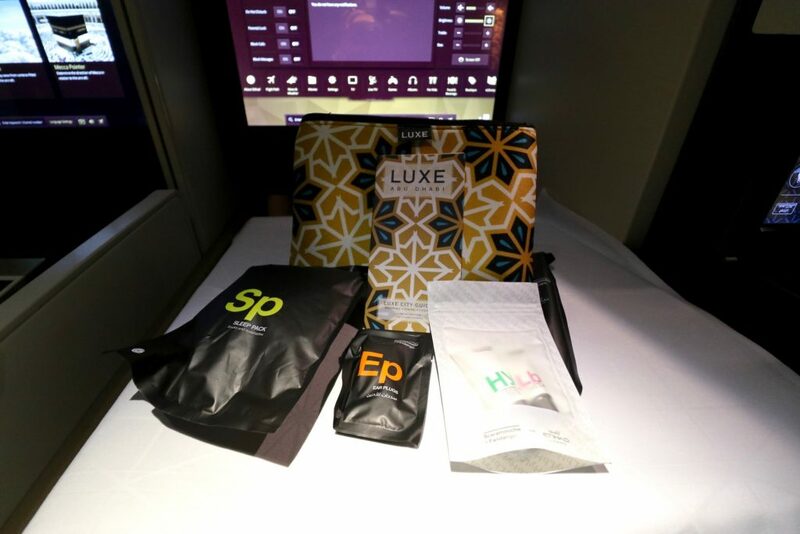 The Business Studio product was really impressive and has to be the most sophisitcated and chicly designed among leading business class products of commercial flight at the moment. But I’m also happy to report that Etihad is not just resting their laurels on a superior product. Their customer service on-board is also just as stellar. 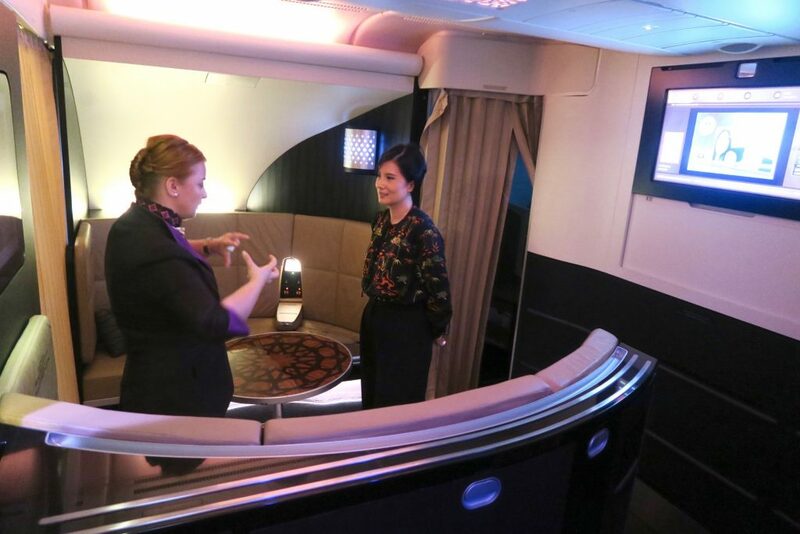 Have you flown on the new Etihad Airways Business Studios? How was the experience? We were upgraded by Etihad Airways for the purpose of a review, however all opinions and thoughts of the experience are mine. I’ve never flown Business Class but it’s on my list of 101 Things to do in 1001 Days but I might have to wait to win the lottery first. I’m actually considering flying Etihad to go back to the UK after Easter, if only my budget would stretch to the upper deck. It all looks utterly fabulous! Hello Jean, I have indeed… I flew Etihad Business to Edinburgh and back in January. 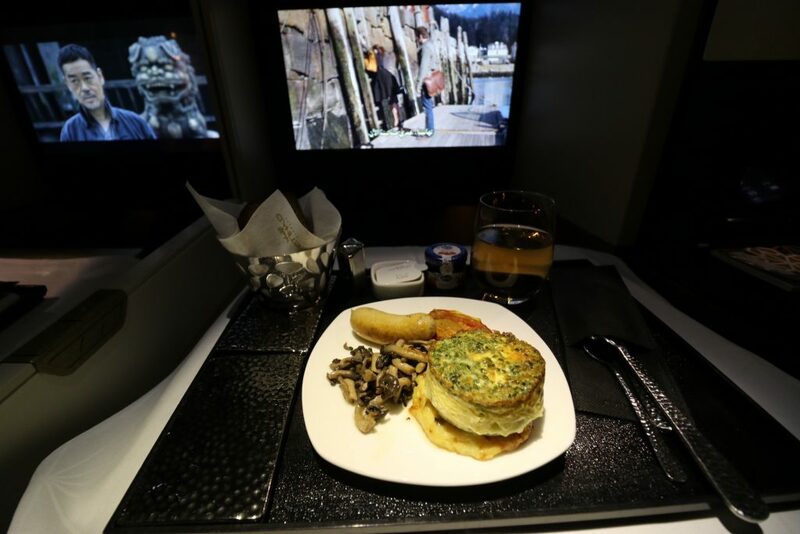 It was by far the most cost effective business class seat flying into Scotland … I had no kids with me and justified the cost that way, plus I went for ten days only so the business class flights made the trip really pleasant rather than a nightmare. Your review is very thorough and I agree with what you’ve said. I’d have loved more choice in movies… but that’s my only pickiness. 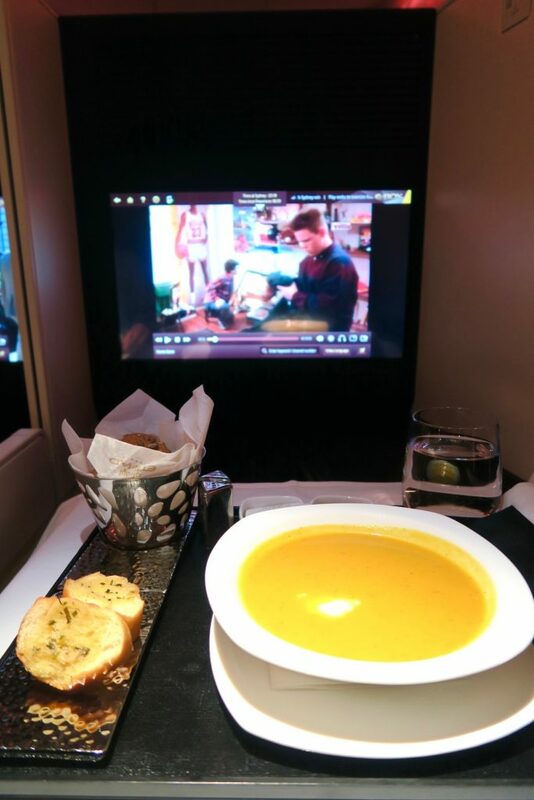 My wife and I flew back from Our honeymoon at Maafushivaru to London with Etihad, with the second flight on the A380 in business. 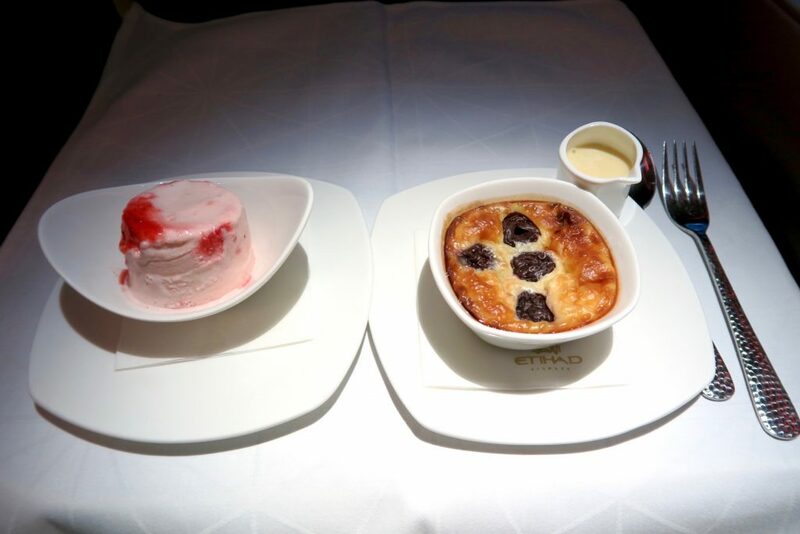 We did feel like Etihad have a very classy product. It was like we weren’t on a plane and it did feel like we were the only passengers due to the space and privacy the suites gave. The flight itself seems like an epic adventure (even before the actual destinations). 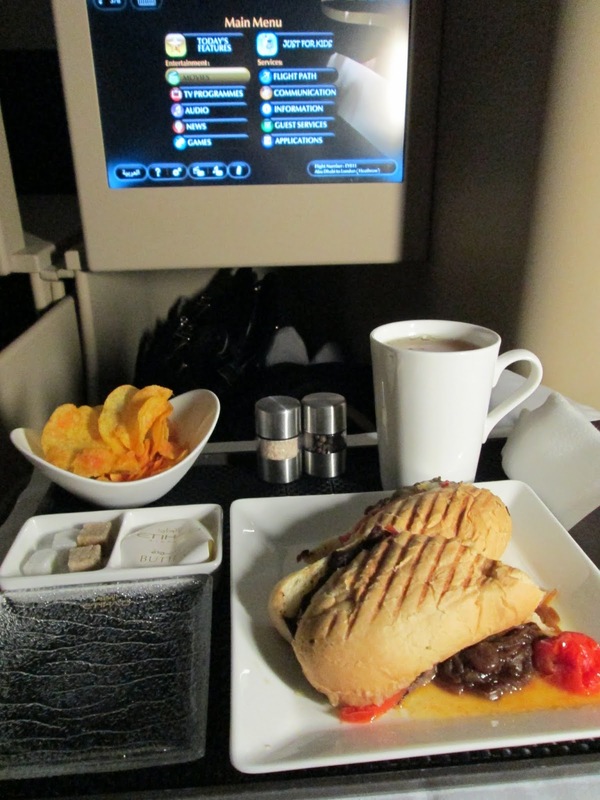 I’ve heard a lot of raves for Etihad with their top-notch services and flight facilities. Would love to fly with Etihad soon and glad that you had an awesome journey with them. Now I’m wondering if this is where my boyfriend should take me on our next date?? HAHA. This is incredible, hope it was as relaxing as it looks! Very impressive, they really upgraded their business offer compare to years before. What a great step!